Over 25,000 people attended the Papal Mass Last Wednesday, September 23, 2015 in honor of the Canonization of St. Junipero Serra. 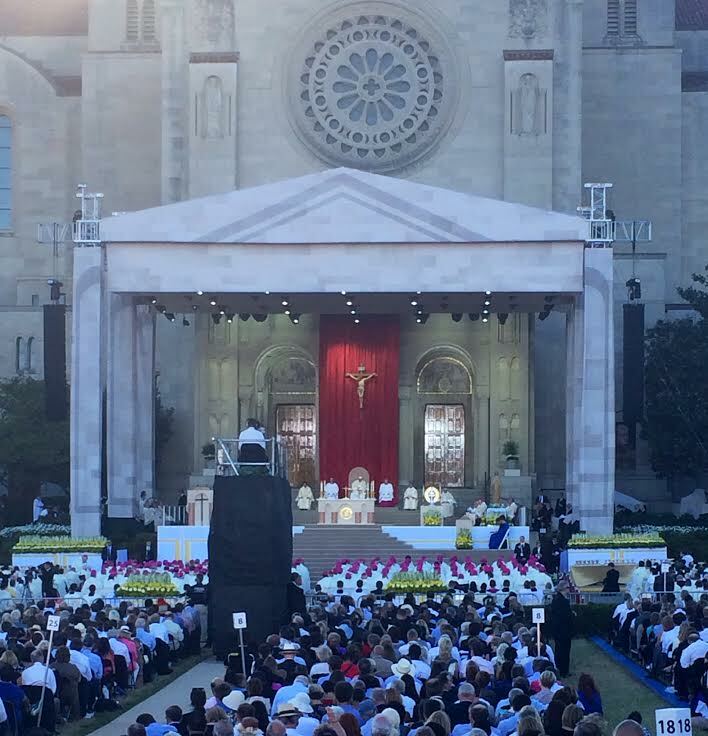 The Mass was held on the lawn of the Basilica of the National Shrine of the Immaculate Conception. On September 23, 2015 The Catholic University of America was filled with over 25,000 people gathered to attend one of the most historical events of the century. Pope Francis was in the United States for the first time to canonize the first saint on U.S. soil and to celebrate Mass at The Basilica of National Shrine of the Immaculate Conception. Weeks prior to the Canonization Mass of Junipero Serra, Catholic University prepared for the Pope Francis’ arrival as a community. 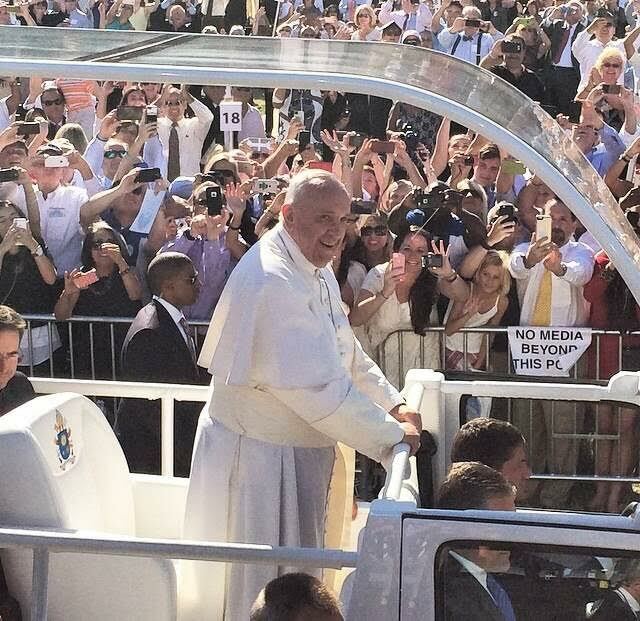 Students gathered around the Pope Mobile as Pope Francis and his security staff rode through the lawn of The Basilica of the National Shrine of the Immaculate Conception last Wednesday, September 23, 2015. Many students and faculty were thrilled that they would have the opportunity to attend the highly anticipated event. While thousands of people were allotted tickets and anticipating celebrating the Papal Mass, there were a few students at Catholic University who opted not to attend for several reasons. On the day of the Canonization Mass, not everyone was busy waking up early to make sure they looked their finest for Pope Francis and to guarantee getting a good spot in the audience. There were many students who carried on with their class-free day as they normally would. Brendan Bedore, a junior Musical Theater major, made a personal decision to not attend the Mass because he had no religious affiliation. Instead, Bedore caught up on homework obligations and attended the Ed Sheeran concert that day. Madalaina D’Angelo, also a junior Musical Theater major, also decided to not attend the mass for religious reasons, but used the opportunity to visit a friend at the University of Delaware. “I knew what he means for a lot and I did not want to take that special moment away from anyone,” said D’Angelo. There were other students such as junior football player, Blair Davis, that did not attend the Mass because he did not check his email in time and missed his opportunity to secure a ticket and thought it was too late after the raffle was over. Montero did in fact get a ticket for the Papal Mass, but gave it to her brother-in-law when she could not get out of work and also regrets that she missed this big day. There are other people also who received a ticket for the Mass, attended the Mass, but left soon after they got a photo of Pope Francis and went on to do other things with their day. Valentina Cordova was one of the students who left short after attending. Cordova went because of the historical aspect but opted not to stay for the two hour Mass. As soon as she was able to get a picture she socialized with other students who did not attend, ate some lunch, and did some homework . Cordova says she does not regret her decision to leave the Mass.